I heard Hardy could be up for both an Oscar and a Razzie for this movie, so it's definitely all over the map. JoBlo liked it and said it was an old-fashioned horror film, so I'll go with that and low expectations today. I wouldn't go as far as saying he deserved an Oscar for this, but he did show that he was more than up to the task. I'm glad some people liked it, despite its flaws. Hopefully it makes enough money and we get a better refined sequel sometime down the line. I think superhero movies are going to need material like this to survive the extreme expectations big events like Black Panther and Avengers: Infinity War created. We already saw major events in DC films ignored because they didn't seem big enough in comparison to what the MCU was building toward (and because they featured overly familiar DC characters like Superman and Batman behaving atypically). 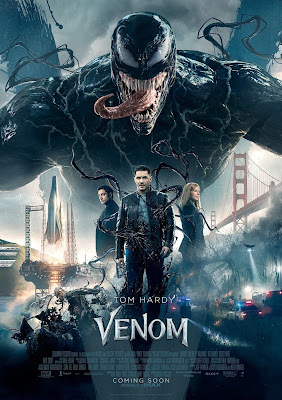 Venom is something that hasn't been possible in the last decade, when superhero movies, and the ones that were widely embraced, were either ridiculously conservative (MCU) or a parody of themselves (Deadpool). Way too often we seem to miss the point of a headlining actor giving a showstopping performance. If the rest of the stuff around Hardy manages to distract you from what he's doing, then that's a problem. But if you recognize how interesting Hardy makes the lead role, then that's more than enough to celebrate. There doesn't seem to be anywhere near that kind of ambition in these movies otherwise. I see what you're getting at Tony, and I kinda agree, which was one of the reasons why I'd been rooting for this movie ever since it was announced. I just wished the whole thing gelled together better. The opening weekend box office numbers already look promising though, so hopefully it is successful enough that we start to get more films of this kind, albeit ones that are better made and don't feel like a cash grab or mere fan service. Its make by graphics, Lots of use image editing in here Thank you for share this article. Looking lovely content amid your blog . Thank you .